An SUV with F1 tech? Sign us up. Ever since Volvo introduced the second generation XC90 back in 2015, we have been extremely impressed. 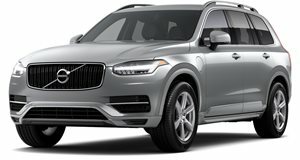 The most powerful variant of the XC90 is the T8 Twin Engine plug-in hybrid model, which produces 400 horsepower from a 2.0-liter twin-charged four-cylinder with a hybrid system and yields an impressive electric driving of 19 miles. Volvo is now refreshing the XC90 for the 2020 model year and the biggest addition is a Formula 1-style kinetic energy recovery braking system. That's right, you can now buy a luxury SUV with technology from F1. Volvo says its new energy recovery system, which will be sold under its new ‘B’ badge, offers up to 15% fuel and emissions reductions in real-world driving. The new brake-by-wire system recovers kinetic energy under braking and stores it for later use. In a press release, Volvo said, "The introduction of the new XC90 ‘B’-badged cars represents a major step for Volvo Cars towards its electrification ambitions." Volvo says it will also offer the system on all 60 and 90 Series cars, meaning other models like the S60, V60, S90, V90, and XC60 will have their own 'B' branded variants. We know Volvo is planning to introduce an EV model based on the XC40 and another EV called the Polestar 2, so this new braking technology could come in handy for both cars. For now, the energy recovery system will only be available on the twin-engine T8 models with electrification, not the gas-only T5 and T6 variants. To complement the new energy recovery system, this 2020 facelift also includes subtle exterior changes including new wheels (in 21- and 22-inch sizes), new exterior colors, and a new grille. Volvo will continue to offer the luxurious four-seat Excellence variant, the more practical seven-seat model, and a new six-seat variant. The 2020 Volvo XC90 will go into production in May at the Torslanda plant in Sweden but Volvo says the new 'B' badge won't available in the United States at this time.